The semi-anechoic chamber is a primary component of the NIST Broadband Interoperability Testbed. Initial and current uses of the chamber include development of wireless coexistence test methods for industry standards; quantification of LTE impacts on Wi-Fi, GPS and other communication signals; and investigation of cohabitation of spectrum between low-data rate waveforms and LTE technology. NIST’s Advanced Communications, Networks and Scientific Data Systems activities enable secure, reliable, high-speed wireless and wireline communications critical to U.S. economic competitiveness, safety and security. NIST measurement science research and support for the development of standards accelerates the deployment of next-generation communication technologies needed for commercial-scale use of connected vehicles, “internet of things” (IoT) applications, drones and future artificial intelligence/machine learning-based systems. NIST is committed to helping solve the measurement and validation challenges of these fast-moving fields to help the U.S. achieve and maintain global leadership in these areas. NIST requests a total of $54.2 million to invest in measurement science research and standards development that will strengthen the growth of IoT, smart systems and artificial intelligence (AI). The FY 2019 request is a net decrease of $13.2 million from FY 2018 levels. With the proposed program reductions, which include $7.2 million in contracts and grants to research universities, NIST will consolidate efforts on its highest-priority capabilities and research. 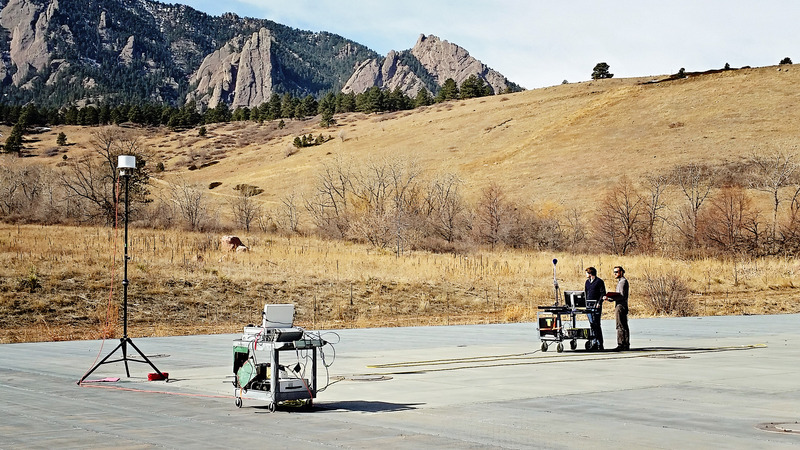 To help design reliable, secure wireless communications systems for industrial environments, NIST staff measure and verify characteristics of wireless channels with a mobile channel sounder in this open area test site (OATS) at the NIST Boulder campus. The NIST channel sounder consists of a transmitter (left) and a receiver (right) synchronized with two atomic clocks. The channel sounder collects impulse response data to capture the reflections, diffractions, and scattering that occur between the transmitter and receiver. NIST organizes a national network of federal, academic and commercial test facilities that provides the unbiased testing, modeling and analyses needed to develop and deploy wireless spectrum-sharing technologies and to inform future spectrum policy and regulations. By collaborating with stakeholders across government, industry, international bodies and academia, NIST supports U.S. leadership in IoT. NIST supports the development and use of standards, guidelines and related tools to advance the use of connected devices and to secure the environments in which they are deployed across industries. NIST cultivates trust in AI and machine learning by developing standards, tests and metrics making technology more secure, usable, interoperable and reliable. NIST is accelerating innovation in technologies relying on complex information relating to human action, behavior or characteristics by providing evaluations, measurements and standards. This complex data access, evaluation and usability affects everything from biometric technologies for forensic science to natural language search technologies.